Robert C. Jackson at work. EAST MARLBOROUGH — Renowned artist Robert C. Jackson will be at Galer Estate Winery in Kennett Square this Sunday December 14th from 3-6pm for a book-signing of his newly released collaborative book project Behind the Easel: The Unique Voices of 20 Contemporary Representational Painters. This book represents the culmination of many years of work where the Chester County-based artist sought personal interviews with some of the most acclaimed living representational artists of our time. Jackson is one of the country’s most popular fine artists, and his oil paintings are widely collected, and included in the cherished collection of The Brandywine Museum. 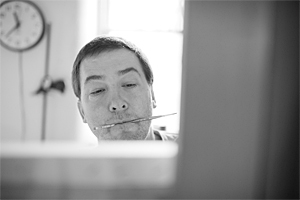 While he is represented in his Manhattan gallery, his studio is right here in Kennett Square. “Behind the Easel” is a large book with over 140 beautifully photographed images of artwork from each of the interviewed artists. While each of the artists’ work will probably be recognizable to most art fans, Jackson’s personal approach as an artist lends an intimacy and depth to our appreciation of each of the artist’s works. In the book, you will get to know Steven Assael, Bo Bartlett, Debra Bermingham, Margaret Bowland, Paul Fenniak, Scott Fraser, Woody Gwyn, F. Scott Hess, Laurie Hogin, Robert C. Jackson, Alan Magee, Janet Monafo, John Moore, Charles Pfahl, Scott Prior, Stone Roberts, Sandra Mendelsohn Rubin, Daniel Sprick, Will Wilson, and Jerome Witkin. Galer Estate Winery has been tied to local arts since its opening in 2011. Co-owner Lele Galer is an artist (not a famous one) and every week the winery showcases different local artists in “Pop up” Art shows. Galer is active in a variety of arts organizations and public art projects, and privately is an avid art book collector. “I can’t wait to buy the book! I saw a copy and it was absolutely gorgeous!” Lele Galer said. Timed for the holidays, this beautiful book would be a wonderful gift to anyone with an artistic heart, and an even better gift if it is signed by Jackson himself. Join Robert Jackson at Galer Estate Winery in Kennett Square this Sunday, December 14th from 3-6pm for his only book-signing in this area!